In the running community, it is common to hear about injuries, training plans, nutrition, and much more. While all of those things are important, something that is often overlooked is mental health. Cross country is arguably much different than other sports. It requires immense mental strength, and your biggest competition is none other than yourself. 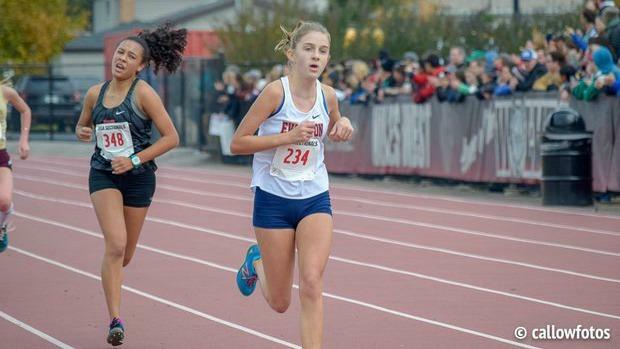 This can lead to many different internal struggles, but one that seems to come up time and time again is anxiety, which occurs in many cross country athletes, no matter what level of competition. I'll be the first to admit that I have dealt with anxiety, and more specifically, Generalized Anxiety Disorder. It wasn't always this way. Looking back, I'd have to say that sixth grade was one of my favorite years of cross country. It was my first year, and everything was new to me. I was happy, anxiety-free, and relished every moment. I set new personal records each weekend, dropped two minutes over the season, and placed 4th at state with my team. A year passed, and I was ready for seventh-grade cross country. I had known that I was going to have to push myself that season, but I didn't know how hard I would have to challenge myself mentally. I remember the first meet of the season fairly well. At the time, I was a tiny, four-foot-six twelve-year-old who was often mistaken to still be in elementary school. Thirty minutes before the race, and all of a sudden, my stomach dropped and tears threatened to fall. I had never felt that way, and I didn't know what was going on. I couldn't breathe, I didn't want to run, and I was completely trapped in my own head. However, I was not going to quit before the race had even begun. I lined up with my team, tears freshly dried on my cheeks, and when the gun went off, I ran my race as if nothing had happened. But it did, and although I wish I could say that pre-race anxiety was a one-time thing, it wasn't, and I'm still working on it to this day. Let's break it down. Anxiety is created in the amygdala, which is also the part of your brain that helps you respond to anxiety by jumpstarting your adrenaline and cortisol. When your brain senses anxiety, it shuts down immune and digestive systems. This can lead to a lack of appetite, decreasing energy and has the potential to compromise the immune system, making it easier to get sick. Anxiety can interfere with sleeping patterns and the ability to fall asleep, preventing your body from fully recovering after a workout or long run. It is also important to understand the difference between anxiety and stress. Stress is triggered by an external cause, such as having a strict deadline or dealing with family issues. On the other hand, anxiety is an internal sensation often described as a feeling of fear, apprehension, or dread. However, there are ways to deal with and manage it. April Likhite, former coach of the women's cross country team at Northwestern University, explained what worked for her during her years as a college athlete, "I came up with a really specific routine that kept me really focused so that I wasn't putting so much thought into what was about to happen." She also emphasized the importance of a sports psychologist and shared a story of one of her former athletes who originally thought that sports psychology was not for her. However, with some encouragement from her coaches, she tried it, and Likhite said, "When she was willing to use that resource, it really helped her learn more about her triggers and learn more about herself as a runner. Through that process, she realized what she loved so much about running." If seeing a sports psychologist or a therapist is not an option, talking to an adult, such as a parent or coach, can make a major difference. I met with a therapist once a week for about a year, during seventh grade, but I also opened up to my parents and teammates and realized how many people cared about helping me. I want to make it clear that during this entire process I never stopped running. Cross country has always been one of my greatest loves and yet for a long time, it was a great source of pain. I wasn't going to let my mind stop me from doing something that I was passionate about and something that I enjoyed. Although my anxiety isn't "cured", and I still struggle with it before races, I've come a long way from the small, fearful, teary girl I used to be. I've shown myself that I'm as strong mentally as I am physical. My message to those struggling with anxiety? Don't stop pushing. You are stronger than the fear inside of you.